Although, Roulette is a game of pure chance many players ask themselves how they can cheat roulette. Some gamblers trying to answer this question gave birth to a number of myths that defraud other players. Many strategies and devices have been developed that are claimed to be foolproof and to guarantee 100% winning. 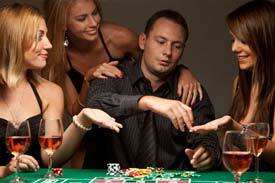 But you should not be so naive and believe all this bright promises as it can lead to ruin and even gambling addiction. It is impossible to cheat roulette as it is a game of randomness and can't be taken under control. So, let's shatter all myths about the Queen of casino - roulette. The story of Joseph Jaggers, who found a bias in a Monte Carlo roulette and due to this fact, won $400,000, inspired many gamblers to explore all casinos in the world to find such roulette wheel. But you should realize that earlier roulette wheels were made by hand that created the possibility of biases displayed on the wheels. Since roulette wheels are manufactured with mechanical accuracy there are no biased wheels in casinos today. If a roulette wheel is noticed to be biased, it is taken away immediately from the casino and tested before being put back. Moreover, it is checked for several times before leaving the factory. You should remember that every spin has the same odds as other spins. The fact, that the ball will never fall on a red colored number each single time, is a matter of simple mathematics. However, many gamblers still continue betting "cold" numbers, the numbers that have not hit for a long period of time. It is illogical and can lead to ruin as "cold" numbers can appear after long time. The roulette dealers are often claimed to be able to control the moving of the ball and influence the result. If you watched the roulette game in casinos, you had to notice that the ball spins around dozens of times before landing. So, it is impossible to control the process. However, the dealer can drop the ball easier, as the result it would be able to be controlled. But in every casino there is a set of rules that claims the minimum speed at which the dealer can spin the ball. The only way you can cheat roulette is to increase your bankroll before you start playing. To do this you can use the casino bonus codes that are available for online roulette casinos.